Molly Budzinski, 16, received the Heroine of the Heart award from the American Heart Association and a proclamation from Sen. Mark Grisanti in recognition of her efforts to bring CPR training to schools in Western New York. If you had the chance to save someone else’s life, would you? What if you had the chance to save thousands of others, and it took less than an hour to learn how? That’s exactly what Orchard Park High School did when it taught its students hands-only CPR during their physical education period. 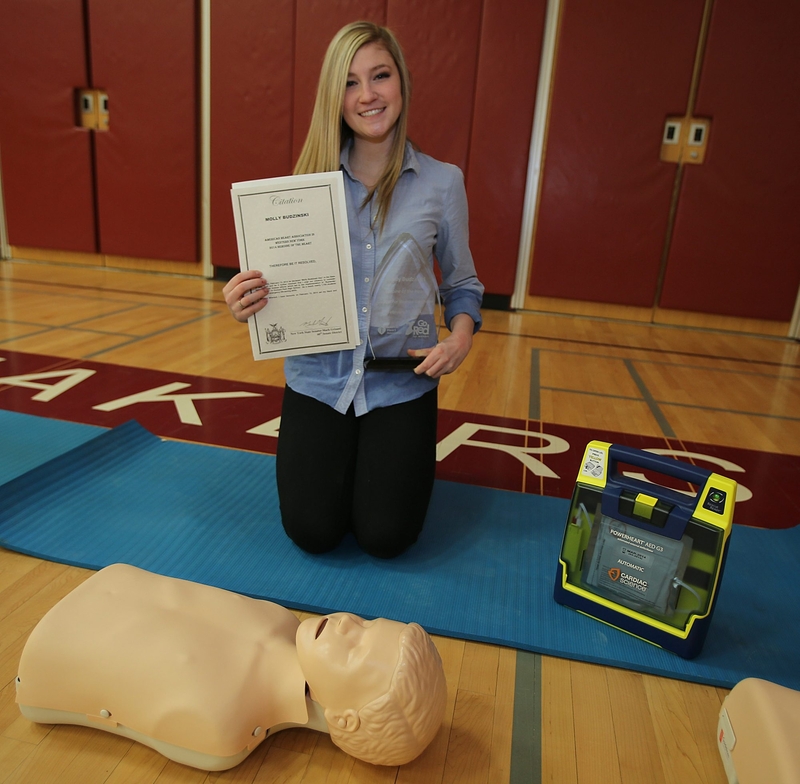 Molly Budzinski, a junior at Orchard Park, is working with her mother, the high school and Rural Metro, an emergency services group, to get CPR taught in school every year. During the week of Dec. 17, Rural Metro provided several instructors along with the mannequins used in the class. The Orchard Park Fire Company also sent volunteers to help. During the session, the students were split into two groups. Annette Adamczak from Rural Metro taught the hands-only CPR method using songs with 100 beats per minute. The second group was taught how to use an automated external defibrillator (AED). The students are not becoming certified, but they are gaining an understanding on what to do if ever in a situation where CPR is needed. This push to get CPR taught in schools is facilitated by the American Heart Association’s support for the CPR in School bill. State Sen. Mark Grisanti, R-Buffalo, introduced this legislation that would make basic CPR training mandatory for all high school graduates. Molly is planning a trip to Albany in June with the American Heart Association to help lobby the bill. To get CPR taught at Orchard Park, Molly and her mother made many phone calls and sent out plenty of emails. They met with Jonathan Wolf, the school principal, and Joe Biondo, a physical education teacher. They raised the funding to bring their vision to fruition. Molly and Orchard Park High School are working with Erie 1 BOCES to get CPR taught at school every year and hope it will spread to other area high schools. Molly started a not-for-profit organization to raise the funding for Orchard Park. She also met with Erie 1 BOCES officials in an effort to supply and raise money to buy mannequins. They are hoping to raise enough money so they can have enough mannequins to rent them out to the 23 high schools in the Erie 1 district on a rotating basis. About 2,500 students would be trained every year through this program. If every high school student is taught hands-only CPR, they will be equipped with the tools to potentially save someone from cardiac arrest. With their skills, the fact that 89 percent of people who suffer an out-of-hospital cardiac arrest die because they don’t receive immediate aid can drop. For more information and to help advocate the CPR in School bill, visit www.supportCPRinschools.org and the American Heart Association’s website, www.heart.org. To learn hands-only CPR in one minute, visit www.heart.org/handsonlycpr. Waverly Colville is a senior at Orchard Park High School.